In January, I found myself in Punta Arenas at the southern tip of Chile with a week to myself. It was my first time in South America, so I was eager to explore as much as possible in the little time I had. I considered flying to Rio de Janeiro or Buenos Aires to relax on the beach. I considered going to Peru to climb Machu Picchu. I even considered the long flight up to the Galapagos. When I realized that Patagonia had so much to offer, I looked into a few different lodges in Torres del Paine National Park and quickly decided on Explora Patagonia. Known for its 5 star accommodations, delicious food and daily exploration options, I was immediately into it. Luckily, I was able to convince my friend Angela to fly down to meet me without difficulty (I was barely finished asking the question and she had already booked her flight). The trek from Canada is a long one. First, the 10-hour overnight flight from Toronto to Santiago on Air Canada, followed by a quick layover, and onto a connecting 4.5 hour flight to Punta Arenas via LAN Airlines. I’ll be doing a separate post about my time in Punta Arenas, including visiting the penguins on Isla Magdelena, so check back for that in a few weeks. Angela is the best travel buddy – punctual, full of colourful commentary, and down for adventure. More importantly, she is also an avid horseback rider, which made our explorations even more epic! More on that below. Angela will also be adding her own content to From Ronus With Love as a contributor, so check back often for more posts on her travels as well. Explora Lodge is – hands down – the most stunningly beautiful, engaging, remote place I have ever been. Often featured in travel magazines like Conde Nast Traveler and design magazines likeArchitectural Digest, this hotel was everything we expected and so much more. The hotel itself is in Torres del Paine National Park in Chile. 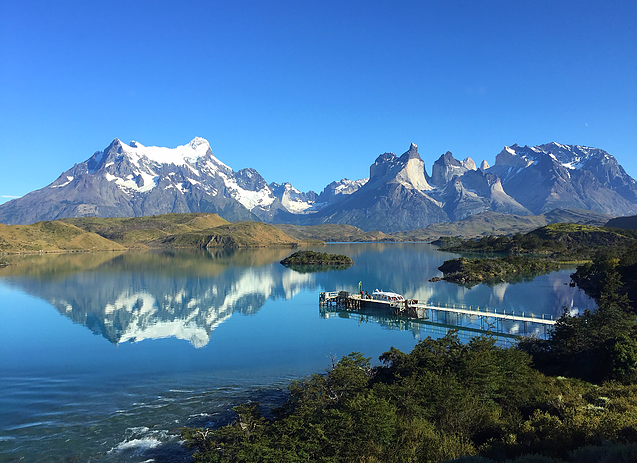 It is situated on Lake Pehoe with a spectacular view of the famous Cordillera del Paine granite peaks – arguably the best spot in the whole park! This is essentially the gateway to the Andes mountain range and words cannot describe the incredible sights at every turn. It looks fake. It looks like a movie set. It’s hard to believe it could actually be real! Since 2005, Explora Patagonia has been nominated every year by the World Travel Awards. In 2015 alone, Explora Patagonia took home the gold as Chile’s Leading Boutique Hotel AND Chile’s Leading Resort. I’m clearly not the first to sing its praises, but I can’t say enough! Explora has 6 other properties in South America that have all been extremely successful as well. Each property focuses on luxury, sustainability, and exploring the great outdoors, making it an ideal vacation destination getting out of your comfort zone…but in the comfort of a king bed. By Air – Rumour has it that they are working on a nearby airport to be completed in 2017. This would eliminate the 5-hour drive from Punta Arenas, but would also eliminate a lot of incredible scenery. Perhaps seeing Torres del Paine from the air would be event more thrilling, but the distance of the journey is part of the allure. It’s so remote! By Helicopter – While this option may be reserved for only the most luxurious travellers, we did see a few helicopters come in and land about a 10-minute drive away from Explora. Some of the helicopters were Park Patrol, but some held guests who wanted to avoid the long drive from civilization. Horseback riding: Before giving Angela and I the opportunity to go on an advanced horseback ride, we had to first go on a “test ride” with a larger group. The 2-hour beginner walking route took us to the banks of Lago del Toro and back. We walked across a small river, chatted with other travelers and truly enjoyed the sun and the scenery. Following the ride, Angela and I found out that Silvio, the head gaucho, had given us Advanced "status" for the rest of our time at Explora, opening up the exploration options considerably! We went on many half-day adventures during the rest of our time at the lodge, galloping through the “pampa” (grassy plains), climbing into the maintains on horseback, crossing rivers on horses who were practically swimming because the water was so high and going full-tilt on a plateau on a mountain-top with a fantastic view of the towers. EPIC does not even begin to describe this experience! I will definitely be going back to repeat this experience more than once more in my lifetime. Travel tip: after each ride, the gauchos like to drink an herbal tea called mate from a small pipe-link dish. They also offer it to the guests, however we did not partake in the large group. The reason being is that It’s customary to pass the same cup around from person to person – we didn’t think sharing with a group of strangers was very sanitary! Instead, we waited until we were on a solo trek to give it a try. It’s quite bitter, but caffeine-rich and part of the experience. after each ride, the gauchos like to drink an herbal tea called mate from a small pipe-link dish. They also offer it to the guests, however we did not partake in the large group. The reason being is that It’s customary to pass the same cup around from person to person – we didn’t think sharing with a group of strangers was very sanitary! Instead, we waited until we were on a solo trek to give it a try. It’s quite bitter, but caffeine-rich and part of the experience. Hiking: Most people who come to Explora Patagonia are there for the hiking. The trails in Torres del Paine National Park are incredibly diverse and beautiful, with many options for every skill level. Mushroom top: When you arrive, you have the option to take an introductory hike to the “mushroom top” summit close to the lodge. It’s approximately 2 hours to the top and back down the other side where an Explora van is waiting to pick you up. The hike is important to help gauge your skill and fitness level so that you choose appropriate explorations for the rest of your stay. Most importantly, you get to the top of a beautiful summit with an outstanding view of the towers. (Travel Tip: we learned on this short trek the importance of bringing adequate water supplies, sunscreen and layers on future excursions. Always bring a backpack and come prepared!). Grey Glacier Hike: This 11 km hike is just one leg of the famous “W” hike and requires a decent level of physical fitness. There are lots of ups and downs, which adds to the beautiful scenery (and also a nice bum workout!). We were paired with a fun group of hikers from Germany and NYC, and our guide Ben provided lots of interesting facts about the local history and wildlife along the way. (Travel Tip: Since you will literally be in the middle of a large forest, be prepared to fill your Explora water bottle in a stream of fresh water coming down from the glaciers on the mountain tops and pee freely!). At the end of the 11 km hike, we came to a campground where we then sat on the rocks overlooking Grey Glacier and enjoyed a tasty packed lunch from Explora Lodge. They give you a packed lunch in the morning (which you carry in your own pack), but our guide Ben also brought hot soup in his backpack, as well as guacamole and hot sauce to add to our lunches – such a nice surprise! Most lunches are either meat, fish, or veggie sandwiches, but I opted for a quinoa salad with vegetables and smoked salmon. The team was happy to accommodate a special request, as long as it’s made in advance. Grey Glacier Boat Ride: After lunch, we were taken to a boat that was waiting to take us for a closer look at Grey Glacier from three different viewpoints. It was absolutely FREEZING, so be sure to pack even more layers to wear on the deck of the boat for the best view. The bonus at the end of this day was that the boat staff were handing out pisco sours on board for the boat ride home. After an 11 km hike, a large lunch and a cocktail, we spent the rest of the boat ride home having a little siesta in the warm cabin. A day at the quincho: One of the featured day trips at Explora Patagonia is a day at the quincho – a small building with a large BBQ pit in the middle of it (more on the BBQ lunch below). The quincho is about an hour’s drive from the main Explora Patagonia lodge, but the weather can be completely different. It’s slightly warmer at the quincho and almost has a desert feel. Angela and I used this opportunity to explore a different part of Torres del Paine on horseback and had two of the most insane rides of our stay. In the morning, we did a 2.5-hour trek in one direction and ended up at the gaucho’s estancia (farm), where they live and keep their horses. It was a special experience because only a few riders can do this trek. It’s quite far from the quincho, and the majority of the ride is done at a full-out gallop! My horse for the day was incredibly powerful and knew the route well – I let him take the lead and just held on tight! During the afternoon trek, we went into the mountains overlooking the towers. The view was absolutely breathtaking. Unfortunately, I was also quite fearful of heights at this particular moment, and spent some of our afternoon trek peering off the edge of a cliff with a tight grip on my horse’s mane. Lucky for us, our horses were far more experienced on the land and took the trek in stride. It was one of the more exhilarating days of my life! (Travel tip: they don’t put on the quincho every day, so be sure to inquire and fit it into your exploration plan if you are interested – which you should be!). BBQ Lunch – The lunch spread put on at the quincho was nothing short of incredible. In the middle of nowhere, the Explora team was able to set up a salad bar and a bar with wine, beer and non-alcoholic beverages, all while BBQing two lambs, beef tenderloin, salmon, potatoes and vegetables – my favourite lunch at Explora! Hotel Spa: A busy day on a hike or on horseback always ended at the spa! Explora Patagonia has 4 hot tubs overlooking the Paine River. The hot tubs offer an amazing opportunity for relaxing your body and getting to know new friends. In addition to the hot tubs, there is an indoor lap pool, indoor Jacuzzi and a sauna. While we did not partake, you can also book massages at the spa for an additional cost. Within a day of being at Explora Patagonia, it became evident that jumping into the Paine River, which consists of glacier water coming from Lake Pehoe, is a rite of passage for guests at the lodge. We didn’t want to chicken out, so on day two – we went for it! The water hits you like ice, but was totally worth it. After jumping in, I quickly grabbed a glass of bubbly from the nearby stocked fridge and jumped into the hot tub to thaw out. Exploring the grounds: The boardwalk around the perimeter of the property offers incredible views of the surrounding landscape – a river, a lake, a waterfall, the towers and the lodge itself – everything is worth a look! Grab a cocktail and talk a stroll before dinner for a chance to see the property in a different light. On one of our walks, we stumbled upon a deer who apparently spends a lot of time in the local vicinity – so adorable! Be sure to head down to the dock after dinner one evening to admire the lodge in the evening glow, as the sun goes down.